Hooray! We dodged last night’s snow storm! Originally the forecast was a winter storm warning and an estimated 6 to 9 inches of snow, it went south of the Twin Cities. So I was able to spend some time quilting instead of snow removal detail. Time to catch you up on the Baby Quilts / Lap Quilts. Yes, as soon as Roxie saw this quilt set together she said she wants one to use as a lap quilt and it will be the perfect size for a lap quilt. This is how I cut the table runners into sections for the sashing columns, I just folded them a couple of times and cut 2 ½” strips. I cut the strips from several table runners and arranged them into sashing columns, staggering where the denim squares were ending up. This is the design wall audition for the sashing columns. Now to try everything out together on the design wall; block columns separated by the table runner sashing. I love it! 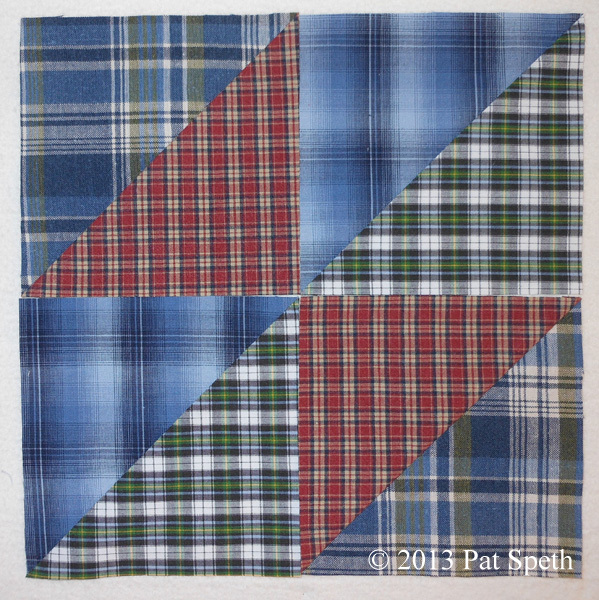 This quilt has been put together and is ready to load on the longarm. I just have to clear off all the clutter that has accumulated on the machine and get going! I designed the baby quilts I’m working on by starting with the desire to use these table runners somewhere in them. To tell you about the table runners I need to take you back to last summer and the preparations for Roxie & Tom’s wedding. My daughter Roxie and her husband Tom love plaid and love the concept of upcycling. Well … I just happened to have on-hand tubs full of men’s plaid shirts many of which I only paid 25¢ a piece for. 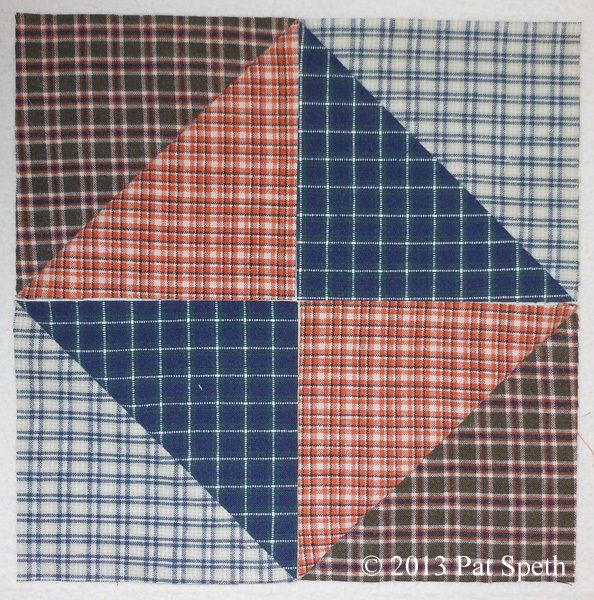 All are 100% cotton and were intended to be cut into 5″ squares for quilts. 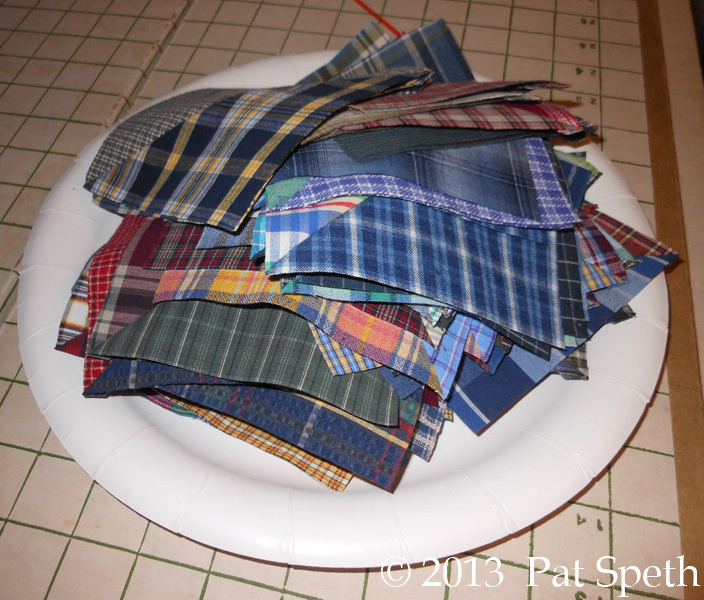 Roxie decided the shirts could be put to better use first as table runners in their plaid themed wedding, she does come up with some good ideas! Mary, Tom’s mom (and also a quilter), volunteered to sew the table runners and I helped out by cutting the backs out of 60+ shirts and chunks of denim from women’s dresses to help speed the process along. Knowing that we wanted to use the fabrics in the table runners again for quilts after the wedding, all the seams were serged so that they wouldn’t ravel when they were washed. Here are the piles of men’s shirt backs and chunks of denim ready to be turned over to Mary. One of the completed table runners. They measure about 20″ x 68″. 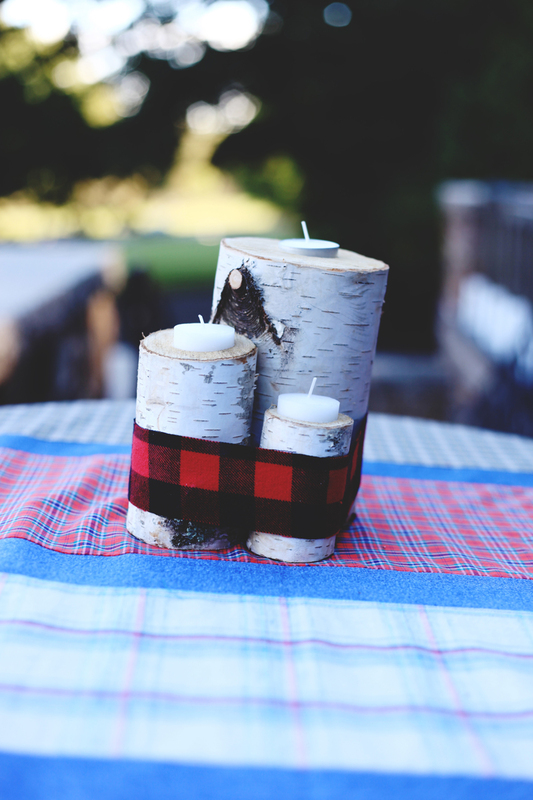 The table runners were a perfect complement for the birch tree candle holders used on the tables. In addition to plaid table runners Mary also made plaid pennants from the same thrift store shirts to hang as decoration at the wedding and reception. 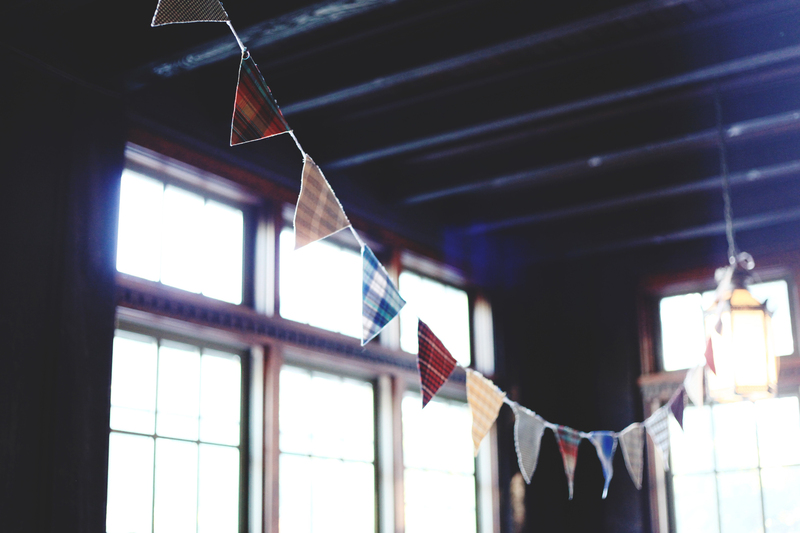 In true upcycling style the pennants are also used again to decorate Roxie’s Frostbeard Studio booth at craft shows. 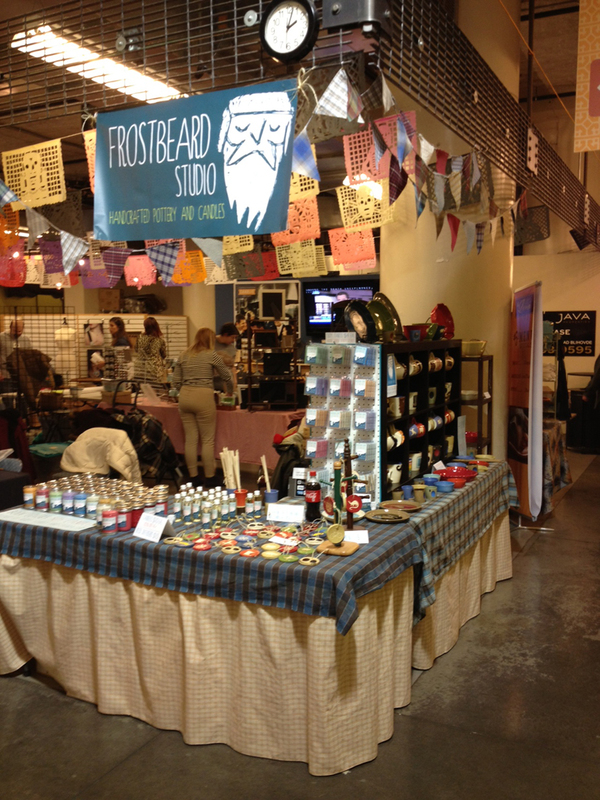 This craft show was the No Coast Craft-o-Rama held in Minneapolis in December. I helped Roxie set up for the craft show and it was fun for me to be just a helper this time. In the past Roxie has helped me set up at Quilt Market so we do have experience setting up, taking down, and hauling stuff in and out of buildings. Now, how am I going to use those table runners in the baby quilts? Stay tuned! I’m back at home after being on the road teaching for the last three out of four weeks. My laptop is not working so I’ve been unable to use it while away from home. It’s been a strange start for my year as far as electronics go- first my DVD player quit working, just when I want to watch a few movies while staying tucked in my house on these winter evenings. Then my camera refused to turn on (sent it off for repairs), third my external hard drive stopped working, and lastly it was my laptop. I’m a little afraid to touch my longarm! Now to catch up on the baby quilts. 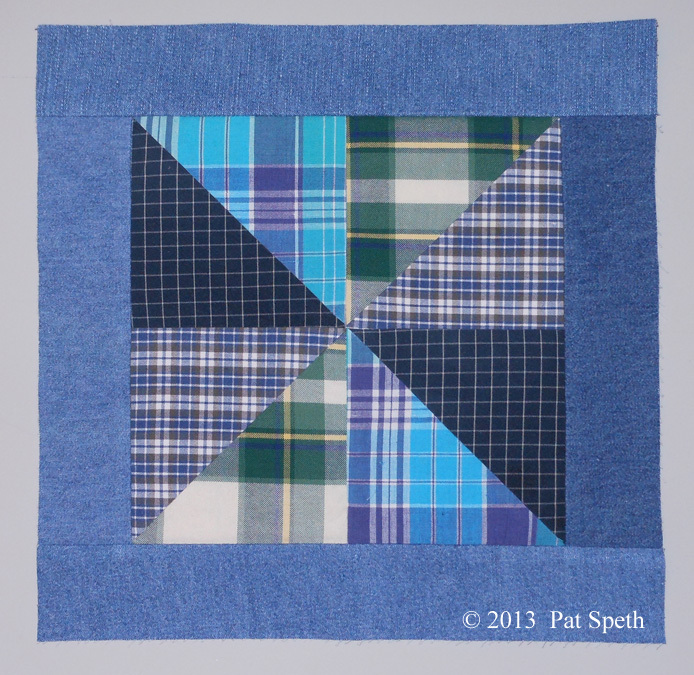 To avoid complete chaos with all the plaids in the quilt, I’m going to divide and conquer by surrounding the blocks with denim sashing. The denim is dress weight or shirt weight denim. 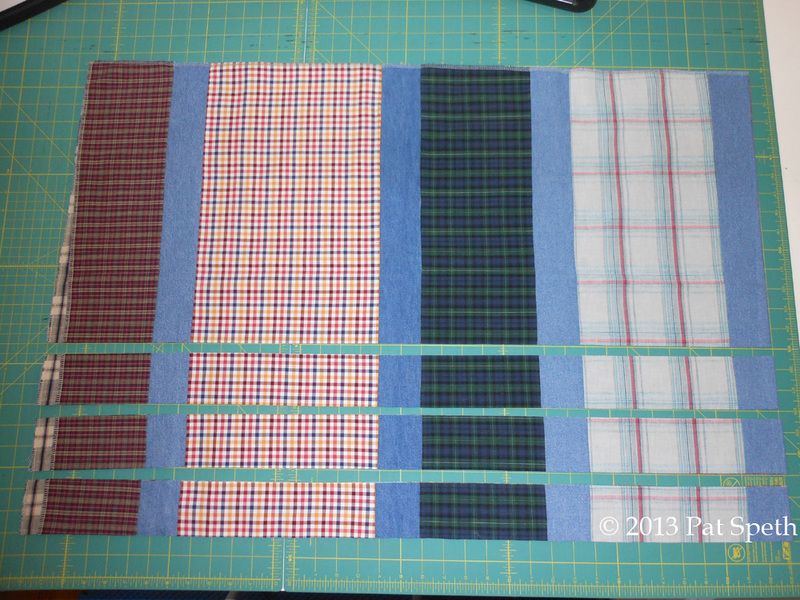 The strips are cut 2″ wide and rather than measuring the exact length for the block (8 1/2″) I’m just sewing pieces on and will trim later. Trimming after both sides have been added. Then adding top and bottom sashing in the same manner as the sides. 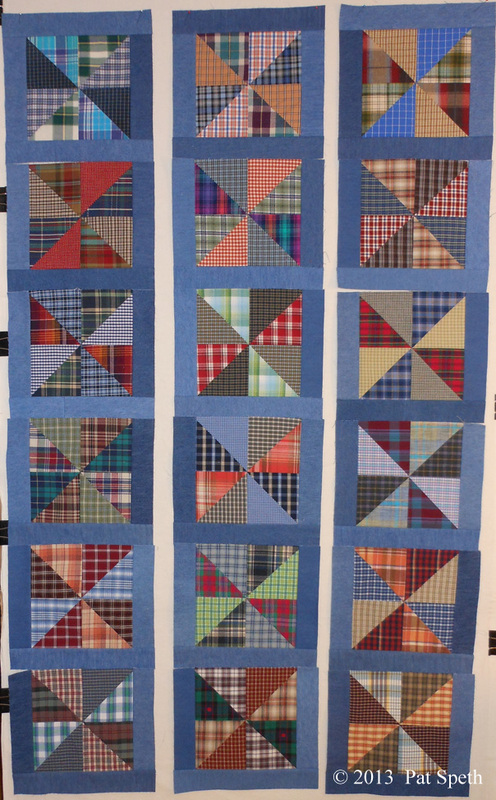 For these quilts I’m going to set the blocks in columns separated by additional pieced sashing. They are going to be three block columns wide so the blocks at the top of the columns will have denim sashing around the entire block. The remainder of the blocks only need sashing on the sides and bottom. 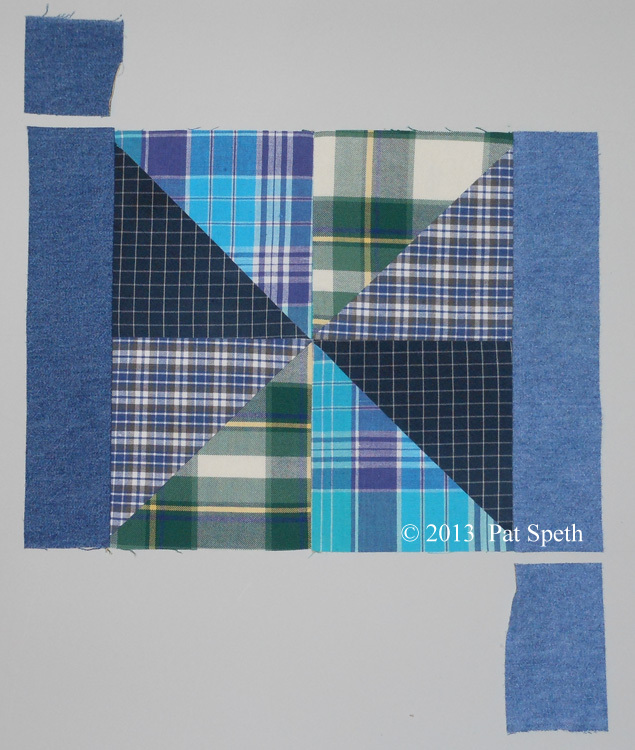 I’m making fifteen of these blocks for one quilt. Here are the columns arranged on the design wall and ready to sew together. Next it’s on to the sashing that will separate the columns of blocks. I finished all the half square triangles for the three Baby Quilts I started earlier this month. 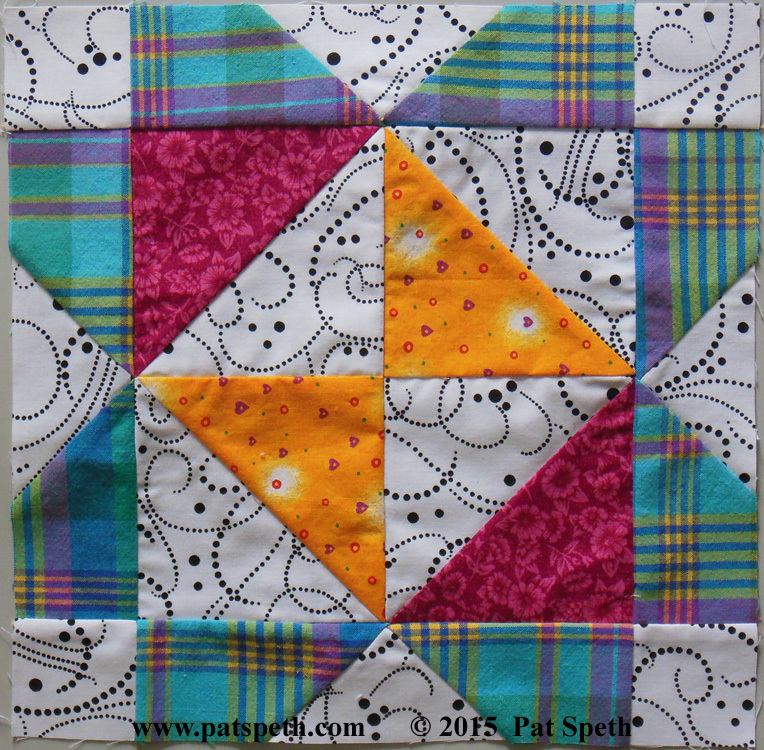 I decided to make each quilt a little different by using different blocks for each quilt. 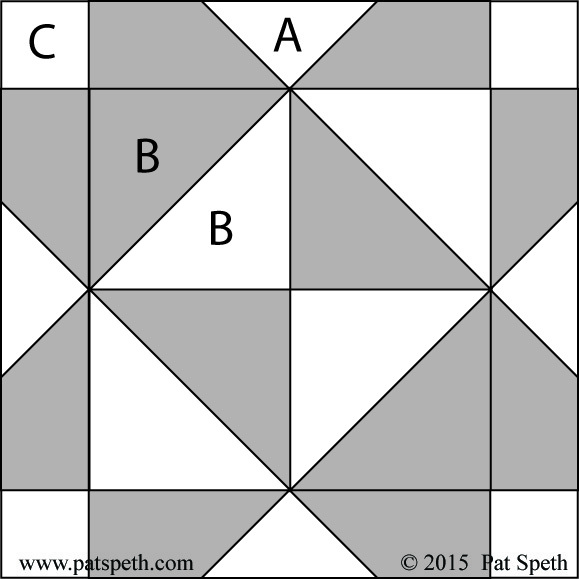 One quilt will have the half square triangle units arranged into pinwheel blocks. The second quilt will have the units arranged into a broken dishes block. The third will use this simple block idea. This block has no name right now, it has elements of the traditional Indian Hatchet, Cedar Tree, and Simple Triangle blocks combined. At this point I lay out all the half square triangles and start arranging sets of them into blocks, stacking each set on either paper plates or cardboard dividers. 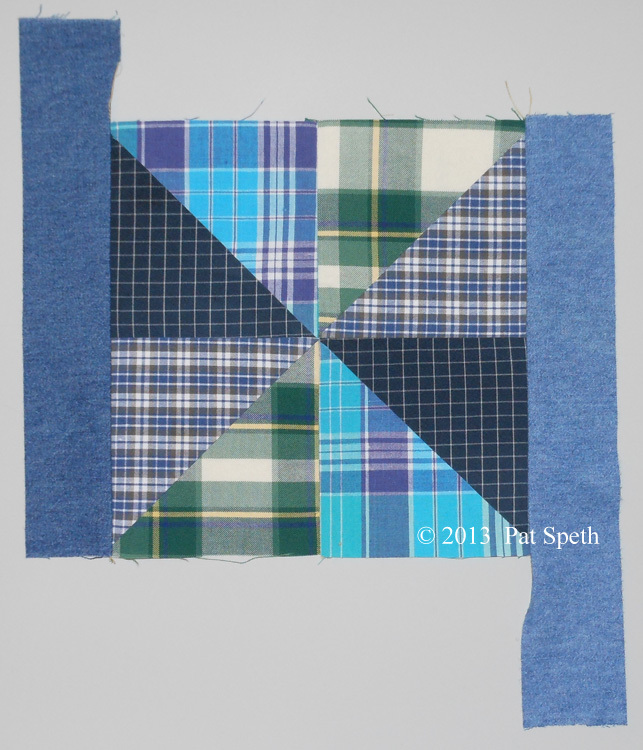 This way I can distribute the plaids between all the quilts and I won’t end up with just blue plaids or small brown plaids for the last quilt. 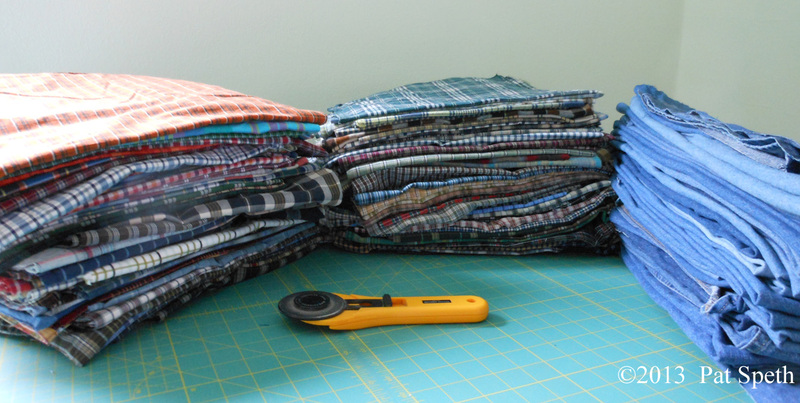 I work this way even when I am making just one quilt to distribute the fabrics throughout the quilt. 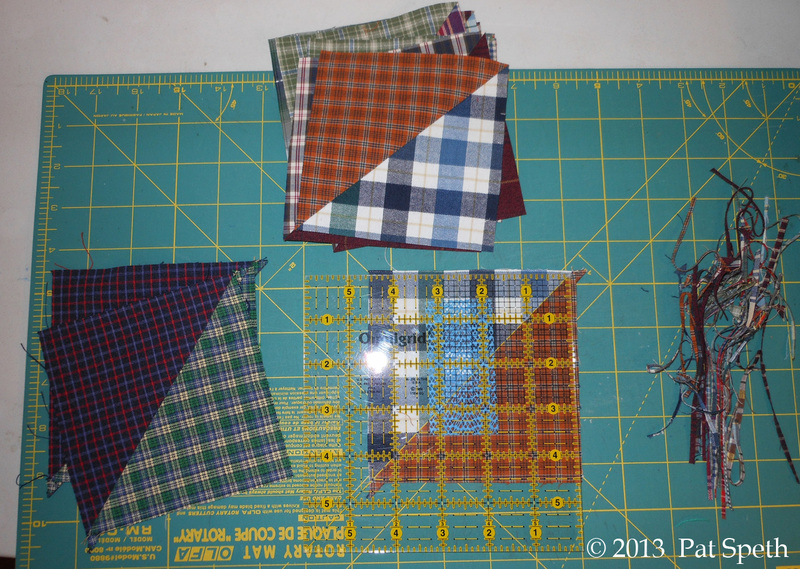 My next step is to get these blocks sewn together! It’s the first of the year and time to do one of my favorite things: start a new project! I have many UFOs, but I love to start new quilts and my daughter Roxie gave me a great excuse to do just that. Three of her close friends have had babies and she asked me if I would make them quilts. 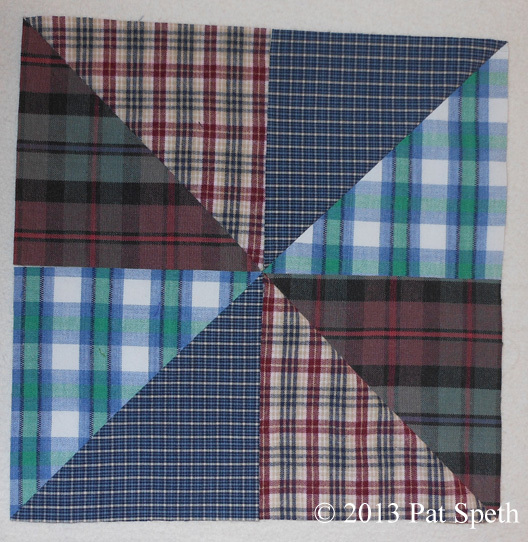 All three babies are boys and both Roxie and I love the idea of upcyling plaid shirts into quilts. 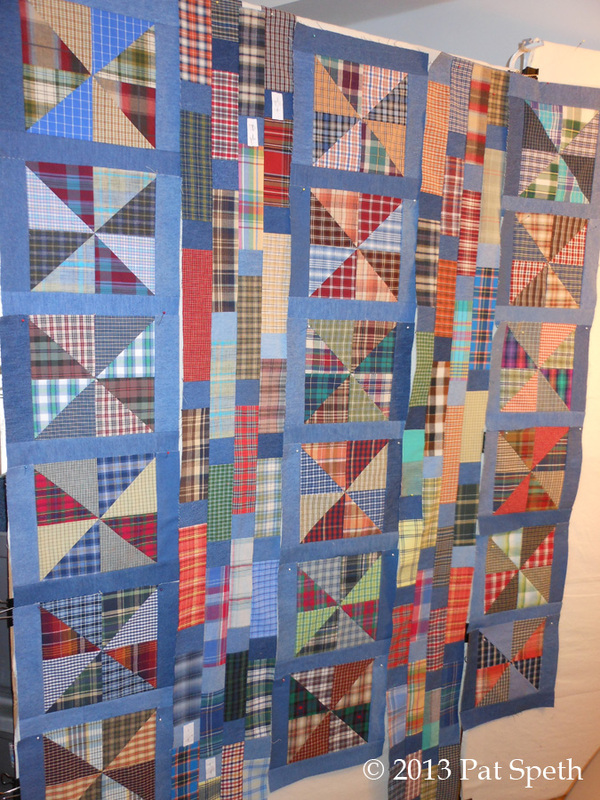 Also added to these quilts will be pieces of the table runners used at Roxie and Tom’s wedding reception. These are some of the half-square-triangles in the process of being trimmed. I tell people that half-square-triangles are my favorite unit to make and I’m not lying, I can create a pile of them in no time! 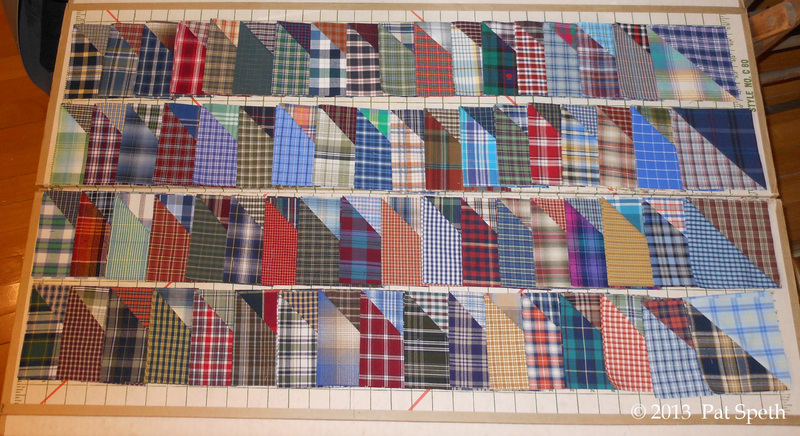 When I have about three-fourths the number of units made that I need I lay them out to look them over before selecting the remainder of the plaids. I like to make sure I have a good mix of colors and values. Now it’s back to the sewing machine to finish the rest of the units and then assemble them into blocks. I know it’s been a while, but here’s how the shrug for the wedding dress turned out! Follow the link to the first shrug posting if you missed it. Step 1. While Roxie was wearing the shirt I sketched pencil lines where we wanted the edges of the shrug to be. I then took the shirt apart. Rather than ripping out the seams I carefully cut right along the seam line. Step 2. 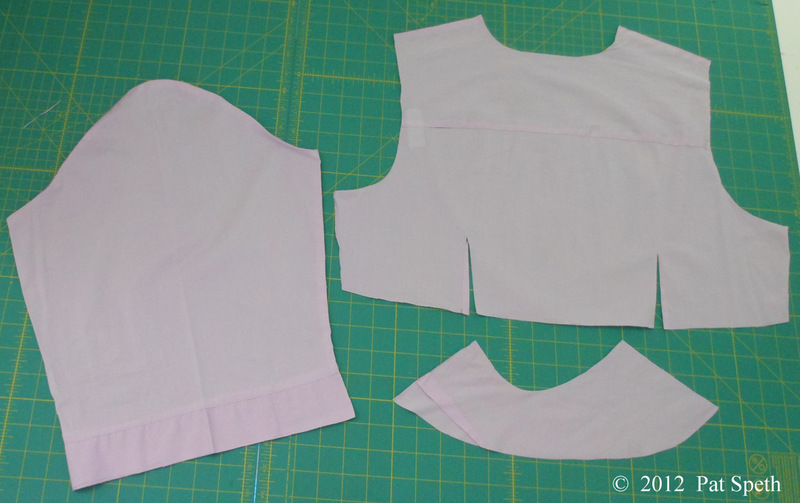 I taped the shirt parts to a piece of non fusible interfacing and drew in a 5/8″ seam allowance all the way around the shirt pieces. After quilting and using a scant 1/4″ seam for years I really had to pay attention to using a 5/8″ seam the whole time I was making the dresses and shrug for Roxie. Step 3. 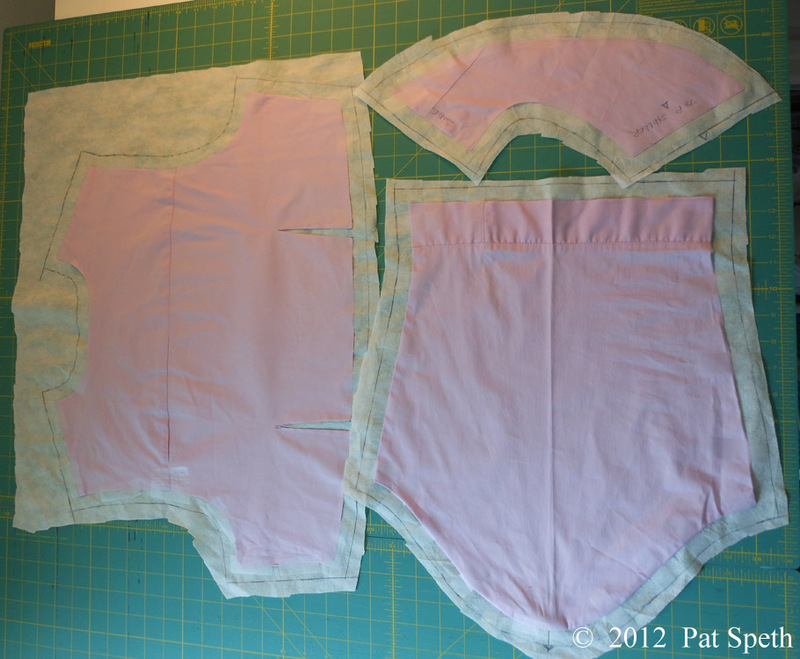 I used the my new pattern pieces to cut out the parts for the shrug and then assembled it. And Hooray! It fit her perfectly! And since the shrug is completely lined it was possible to make it reversible. 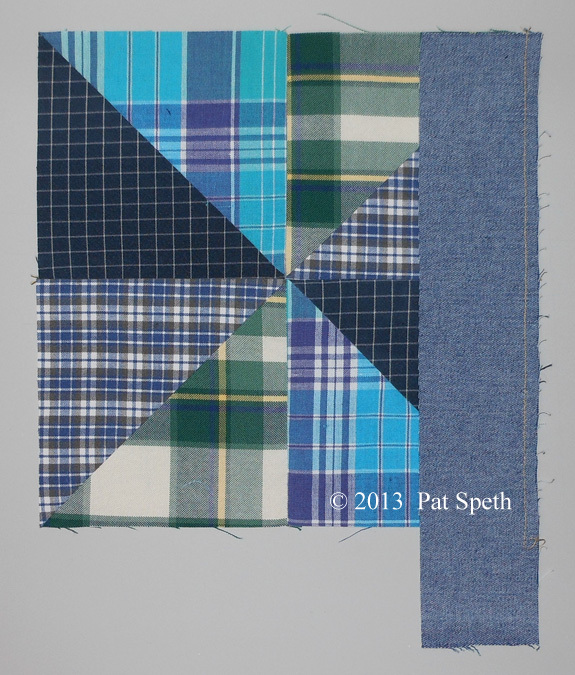 Roxie chose a blue and black lumberjack plaid for the second fabric, since the wedding was plaid themed. 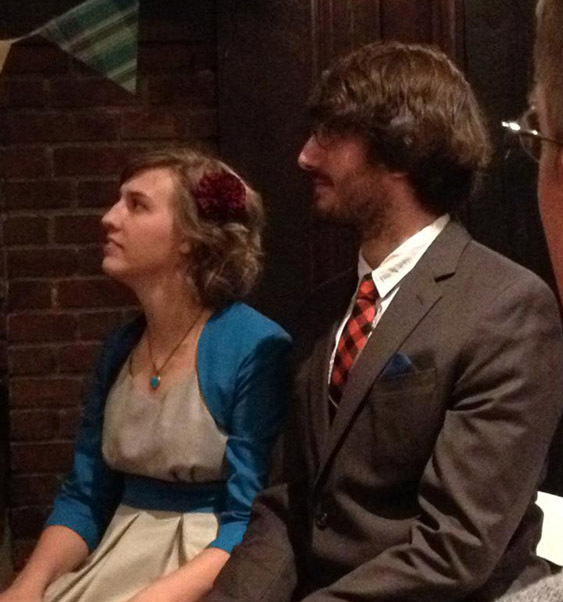 Here are pictures of Roxie and Tom from the wedding. This first one was taken during the ceremony. Roxie is wearing the shrug with the solid teal fabric on the outside, which matched the sash in her dress. 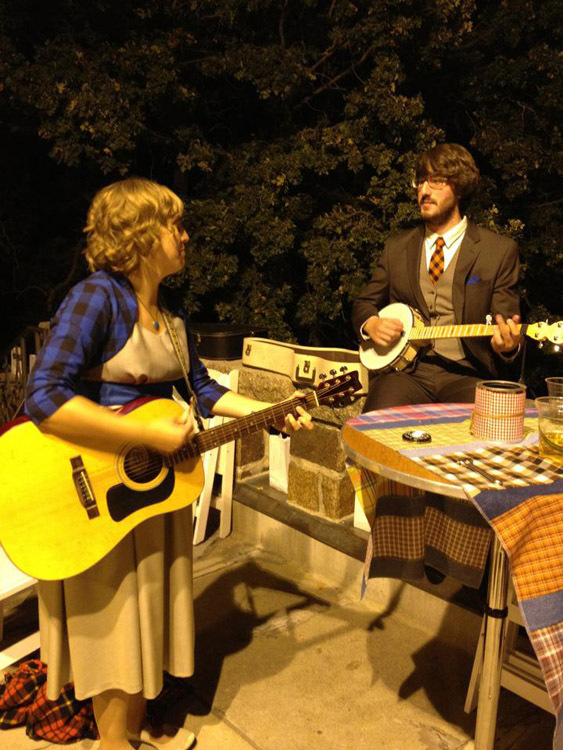 Then, during the reception it didn’t take Roxie long to switch the shrug to the lumberjack plaid side as the happy couple picked up instruments and joined in with the evening’s entertainment. It turned out to be a chilly evening, so I was really glad that Roxie had the perfect shrug to go over her sleeveless dress. Let me tell you, all my sewing and quilting skills came in handy for this wedding!